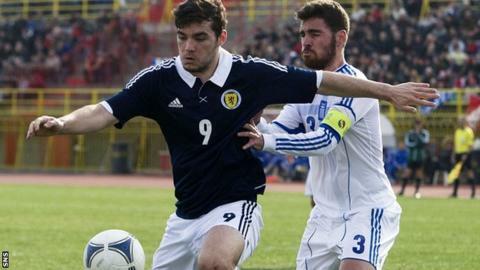 A second-half penalty from Celtic striker Tony Watt earned Scotland U21s a friendly draw in Greece. Nikos Karelis headed the hosts in front after 13 minutes at the Municipal Stadium in Korinthos. But Billy Stark's visitors were awarded a spot-kick on 58 minutes when Kilmarnock forward Rory McKenzie was bundled over. And Watt held his nerve to send the goalkeeper the wrong way from 12 yards. The match served as preparation for the Scots' upcoming qualification campaign for the 2015 Under-21 European Championship. Stark handed debuts to Partick Thistle midfielder Stuart Bannigan and Hearts teenager Callum Tapping, while Dundee United's Stuart Armstrong captained the side. And the visitors came close to the opener with Rhys McCabe testing goalkeeper Andreas Gianniotis and Fraser Kerr failing to bury a header soon after. The Greeks moved ahead when FC Amkar Perm striker Karelis got himself in between two defenders to head home an Apostolos Vellios cross. Keeper Chris Kettings denied Vellios twice before the break and the saves proved crucial as Stark's side drew level after the break. McKenzie was felled by Charalambos Lykogiannis and Watt converted from 12 yards. Greece passed up several chances in the closing half-hour, Costas Triantafyllopoulos heading wide and Kettings was called into action again to block efforts from Giannis Gianniotas and Panagiotis Ballas. Dimitris Kolovos fired straight into Kettings' arms and Gianniotas shot wide late on. Greece U21: Gianniotis, Lykogiannis, Vlachos, Potouridis, Kourbelis, Lagos, Ballas, Vitoros, Kolovos, Vellios, Karelis. Subs: Kapino, Triantafyllopoulos, Fourlanos, Gianniotas, Diamantakos, Katidis. Scotland U21: Kettings, Duffie, McHattie, Kerr, Robertson, Tapping, McGeouch, McCabe, Watt, Armstrong, Bannigan. Subs: Thomson, O'Donnell, Wallace, McKenzie.